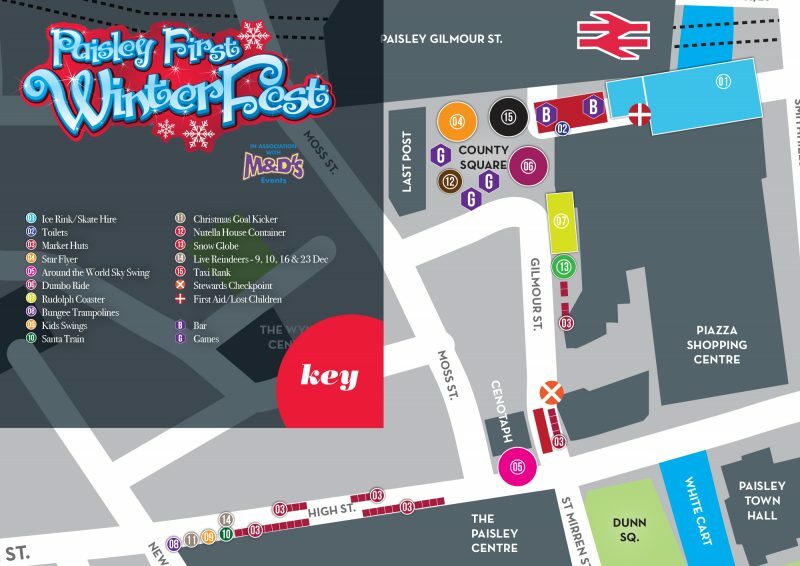 Paisley First WinterFest has arrived in Paisley town centre to help you get in the festive mood this Christmas! In association with M&D events, this Christmas spectacular will run daily in the town until Christmas Eve! Get your skates on for our outdoor ice rink just under the Piazza Car Park. See Paisley in a whole new way with the Paisley panoramic Sky Swing or take part in our free interactive Nutcracker trail for children with a chance to win WinterFest prizes! Take a browse through the continental style Christmas market, or pick up your free Paisley Guide to Christmas – we’ve got your Christmas shopping all wrapped up! 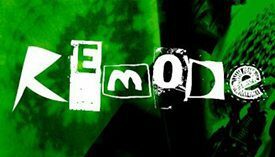 PA postcode? Then get 20% off ice rink prices at the ticket office when you show proof of your address! And once you have had some fun and ticked off your Christmas shopping list, Paisley has plenty of great places for food and drink when you need to rest your weary feet! Paisley also has an array of hair and beauty salons to help you look your best for those Christmas parties, nights out with friends and the big day itself! Paisley First is also holding a free festive Nutcracker Trail with 10 nutcracker kings spread throughout the town from Saturday 2nd December until Saturday 16th December. Paisley First Chairman, Ian Henderson, said: “This will be a great event to showcase everything that Paisley has to offer during the festive season. “There is so much to see and do in the town already and this will help cement the town’s reputation as a visitor destination. “We will also be running a Christmas retail campaign; when it comes to festive shopping we have a lot of fantastic independent retailers as well as national chains throughout the town centre. “And after hitting the shops and enjoying the Christmas entertainment, visitors can take advantage of our many cafes, restaurants and bars. The event is a great showcase for the town as Paisley enters the final straight in the town’s bid for UK City of Culture in 2021 and will wrap up Paisley’s winter season, which has already seen over 50,000 people enjoy events in the town. M&D’s Events Director, Douglas Taylor, said: “Paisley already has a rich cultural scene and this type of Christmas event is an ideal addition to the town. Plus Santa’s reindeer helpers will be coming to Paisley on the afternoons of Saturday 9th, Sunday 10th, Saturday 16th and Saturday 23rd December – come and get a selfie with Rudolph! Heading to Paisley for WinterFest? 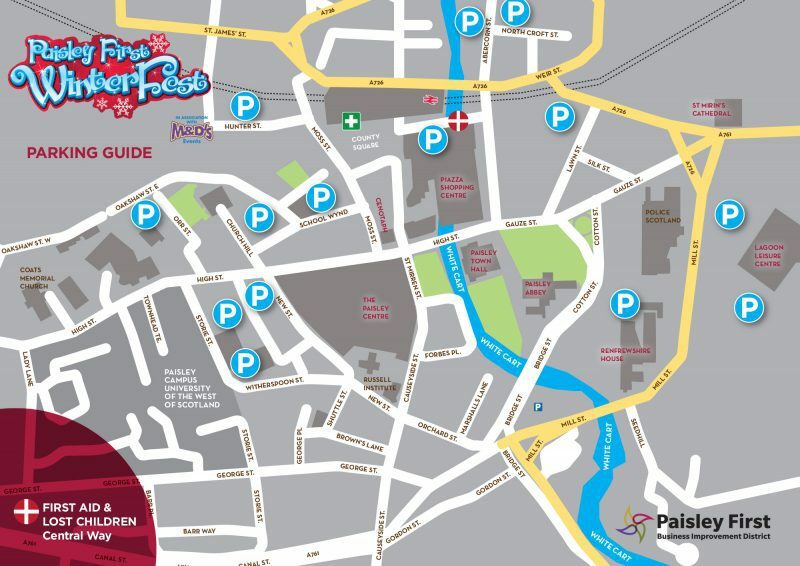 Check out our parking map in advance! You can get a train from Glasgow Central train station to Paisley Gilmour Street train station which will bring you straight to County Square, just minutes away from the ice rink! Plus buses from Glasgow City Centre include the McGill’s 38 bus and First Bus No.9.